Eight games they are a field goal or worse dog; Six of the games they are a touchdown or worse dog. They play only one bottom 10 opponent all season and they play six top 10 opponents. The numbers just don’t add up for me on the over for the Cardinals this year. They have the hardest schedule in the league and uncertainty at QB plus a brand new coaching triangle. I think they will be good soon, just not this year. The Rams have improved the defense and Goff was much improved last year with Gurley lighting things up as well. The new coaching staff reinvigorated this team and it showed. With the amount of games they are favored in this year they only have to play to expectations and will easily surpass this team total. They are facing too good of a schedule this year to be expected to win 8 or 9 games. I think 6 wins is a much more reasonable number for the Seahawks. Their WR corp is below average, question marks with a rookie running back, defense will have a completely new look this year, Wilson will be the reason for any success but I don’t think he can carry them that far. 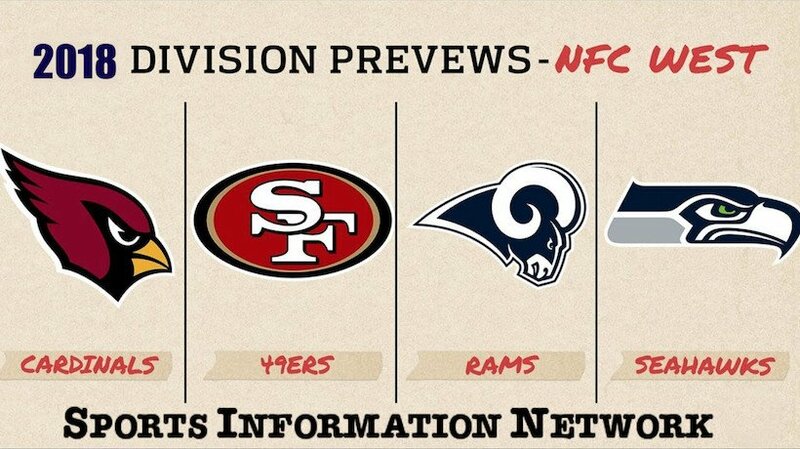 Echoing my thoughts on the Rams, if the Niners just perform how they are expected to, they will surpass the 8.5 win mark. Garoppolo will have had an entire off-season to gel with the coaching staff and the offense. McKinnon should be a positive change in the backfield plus they beefed up their defense some along the way.